The first thing that we will do when you arrive at the pier will be to explain what the tour is and what you can expect to experience. 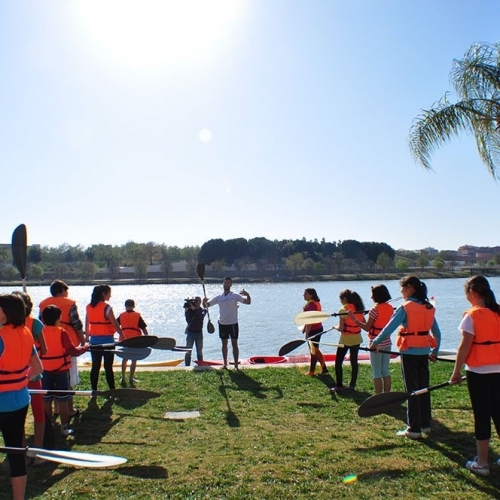 Then, we will do a ground briefing in which we will teach you how to paddle and how to move properly in a kayak. 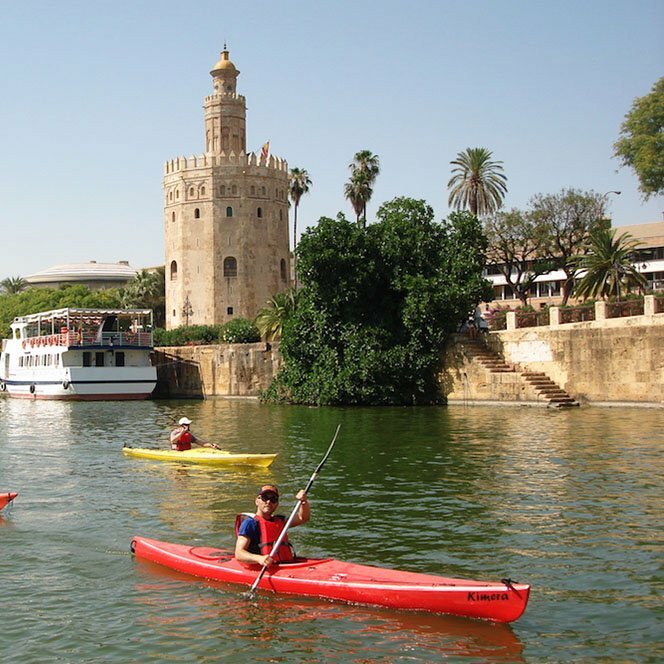 During the tour (if you hired a guide) we will explain the history of Seville, the history of Spanish navigation and navigators, the Golden Age, the circumnavigation of Magellan and Sebastian Elcano, the Indian race, among other unique historical facts. We also compile a photo album for group tours and for particular tours with guide. It is a really nice experience, very refreshing in the summer, and very enjoyable. We adapt to each group and even do games with more active groups. You will learn how to run professional sea kayaks. 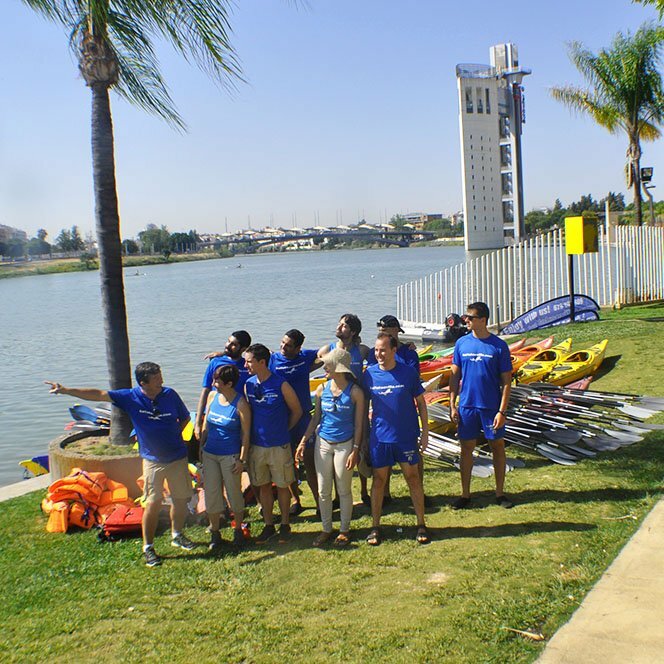 You will also learn kayaking safety signals, safety training and how to help two kayakers without touching the water. 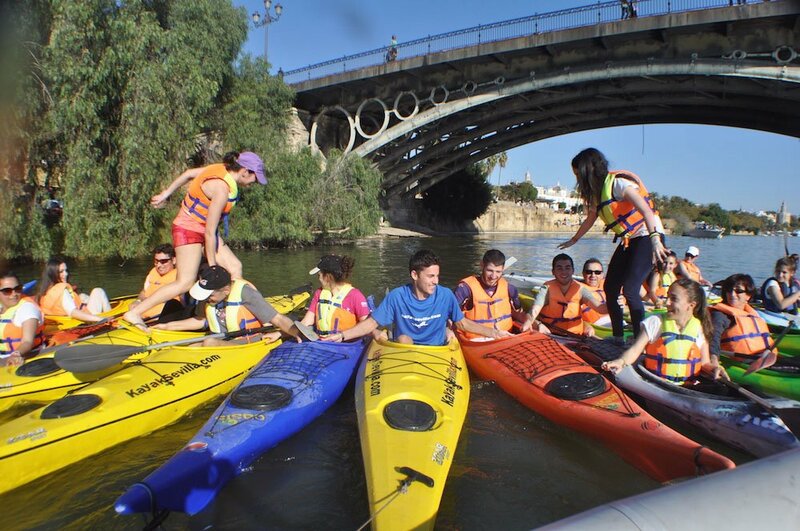 We will teach you the navigation rules necessary to cross the waters of the Guadalquivir river. Our guide (available for hire) will teach the History of Seville such as the circumnavigation of Magalllanes and Juan Sebastián Elcano, the route to Indies, the attacks of the Drakens Vikings in Seville, and other parts of the enormous History of navigation linked to the river of Seville during the Spanish Golden Age. The activity is designed for all audiences. It is a basic activity, it is not necessary to be in good shape or have special physical conditions as it is simpler, easier and more fun than riding a bicycle. In many ways the kayak resembles a water bike. 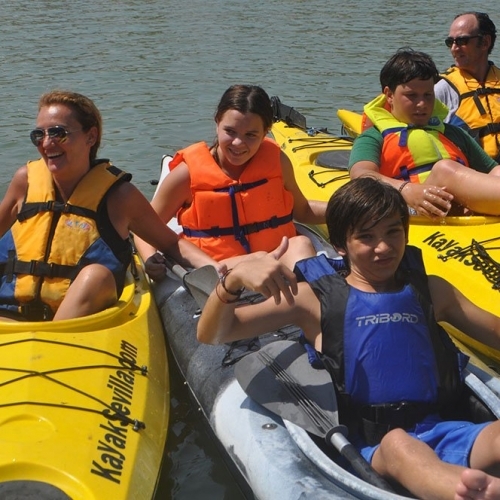 Children under 10 years old can carry out the activity accompanied by an adult in a double kayak, where the child always sits in front. You can come alone or with friends. 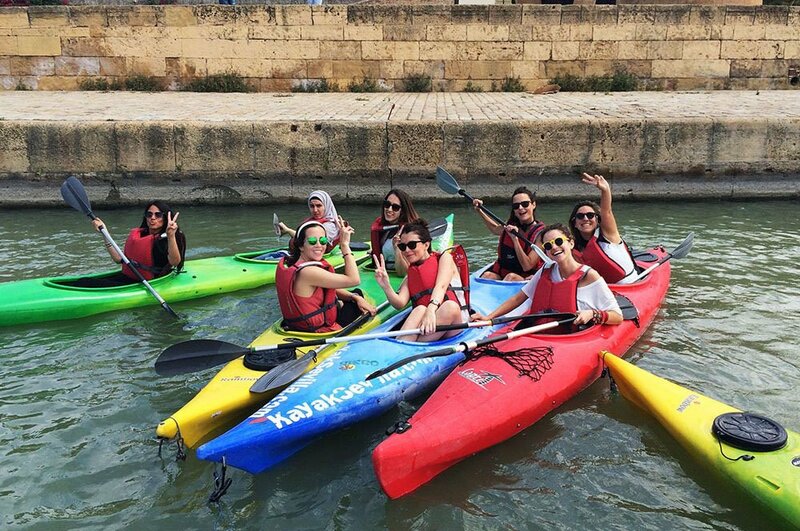 If you come alone, you can rent a kayak and go by your own or hirea guide, but it’s funnier is you join a group of people on the next tour and form part of their group (maximum 25 people). The more the merrier! 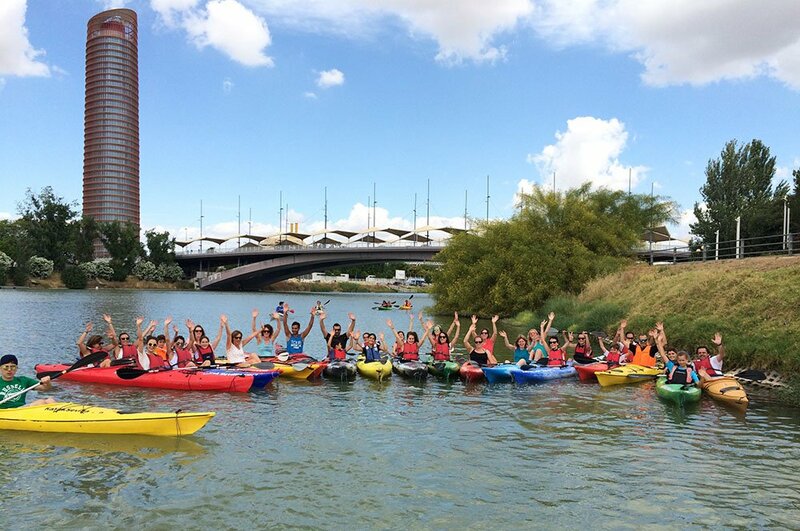 In 2017 more than 2,000 people kayaked with us! Date/hour changes at least 24h in advance. Cancellations 48h. 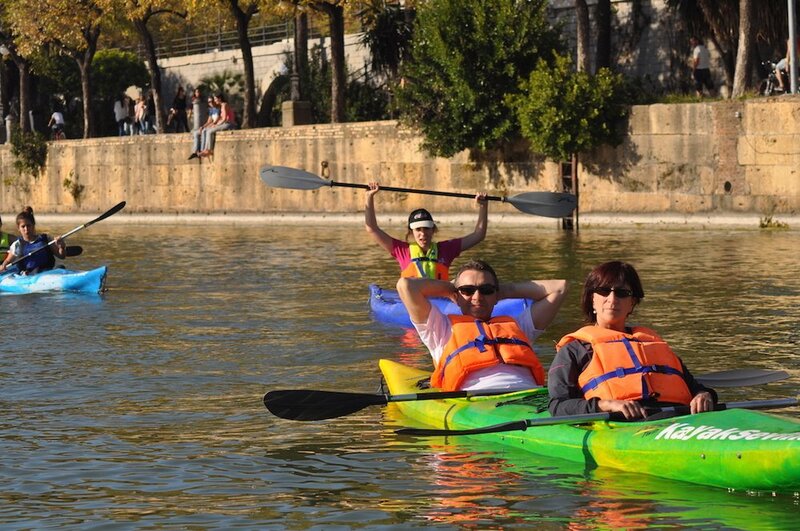 We have a team of instructors trained in water activities who are always prepared and accompany you on your tour of the Guadalquivir while you enjoy the beautiful sights of this amazing city. The kayaks are anti-tip. There are doubles and singles for all levels: initiation, medium and advanced. 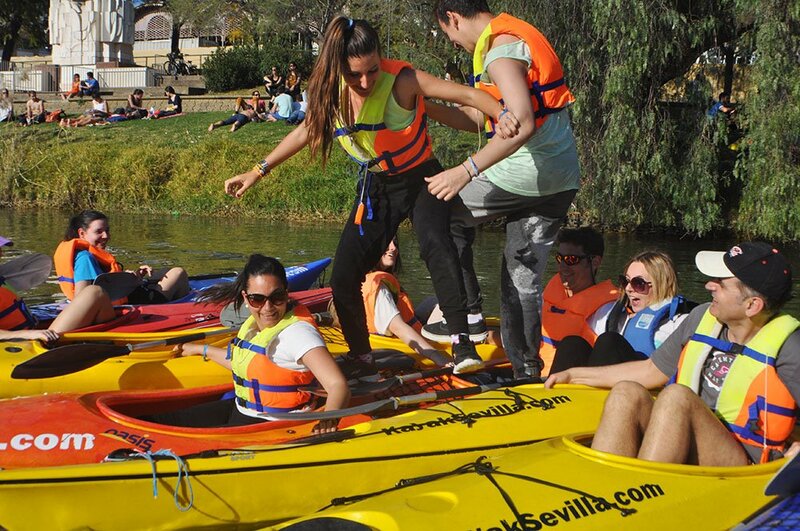 We provide you with all the necessary equipment: paddles, life jackets, motorboat and compulsory insurance. If you are a group, we will shot photos during the tour and create a photo album for you so that you have a souvenir of the tour. In case of a private tour, the photos are included with the guide (available for hire). 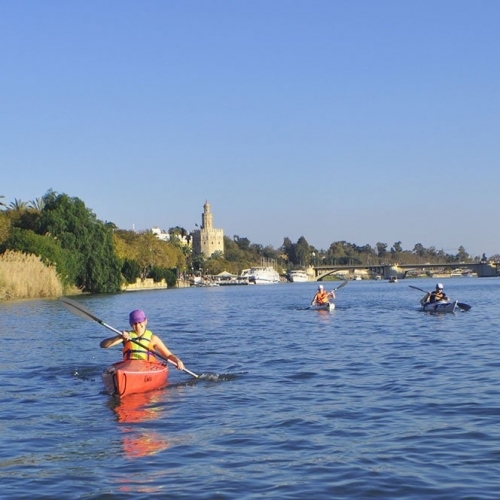 During the tour you will see the most historical part of Seville, you will visit the most important! We are just beside the Navigation Pavilion (Pabellón de la Navegación), so you can reach our location walking from the city center. If you come by car, you can park near the Pavilion (zona Cartuja, Centro Andaluz de Arte Contemporáneo. If you hired a guide or you are a group, your tour starts and ends at the American Garden (Jardín Americano – see map). 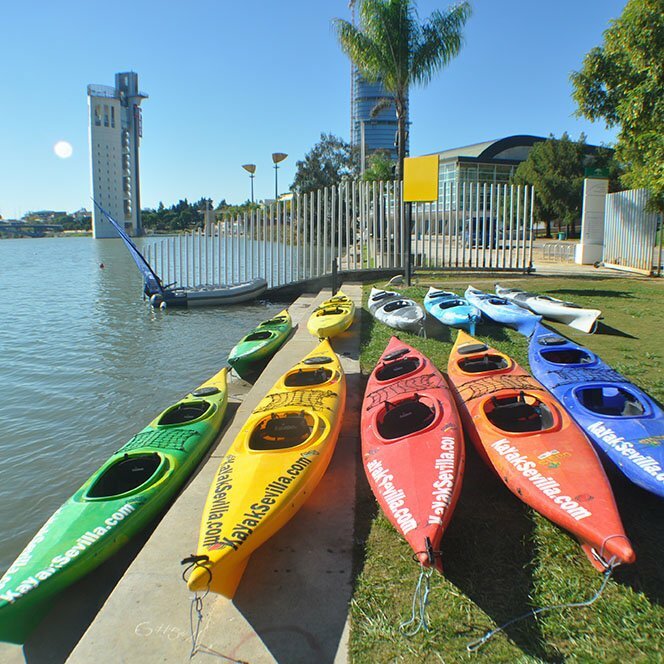 If you go without guide or you rent a kayak, your tour starts and ends at the canoeing Club h2go (Club h2go – see map). Fill in your details and send us the form. You will automatically be redirected to the payment gateway to review your data and complete the process. All payments are processed through Stripe, one of the most secure and most used Internet payment platforms. Once done, you will receive a confirmation email.